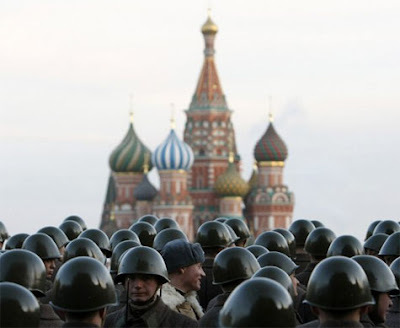 Russian servicemen in historical uniforms stand during military parade training in Red Square in Moscow. The parade will take place on November 7 to mark the anniversary of a historical parade in 1941 when Soviet soldiers marched through Red Square to the front lines of World War II. With a few pictures dedicated to "Dear Old Uncle Sam." Showing them off big time!!! With their fingers in the till. He seems to be loosing his hair in the exact same places as Hanks. And which one can 'play' more parts? Nevermind me I'm getting self absorbed. We are all 'Pink' on the inside. And so much stuff to sell! Hard to believe my Dad had to kill. Harder yet to believe why. And wherefore, and if he had not. For sure I would not be alive. EVERYONE just LOVES BABIES RIGHT? Reminds me of the last name of some kid I went to school with. What movie am I remembering? Gee, you've really got to look hard. Gee, you've got to really look hard.